There is more to travel then just seeing the amazing planet, learning about different cultures, tasting new foods, seeing the sunrise over a volcano, or chasing lions in the Savannah; travel also involves seeing the beauty that exists in yourself and to grow and evolve as a person! Travel opened my eyes and helped to make me a better person. 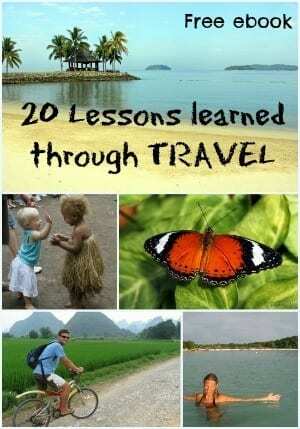 This is why through y Travel Blogwe emphasize the ‘why’ part of travel. When you travel you step out of a world of busyness, structure and sometimes chaos and darkness into a world of freedom and freshness. Your eyes and ears begin to waken your soul to witness something so extraordinary- life! Travel has shown me certain natural laws or principles, and taught me how to apply them to my life so that I can make it an empowered one. These are truths that I find form the basis of a happy and fulfilled life and keep me centered and balanced and whole. It’s these lessons that have helped me live the life that I really want to and to know how to handle problems when they arrive. A book that tells you how to travel. A book that talks of how travel is the only way for you to experience life. As I mention in the book, travel is a process of discovery, and these lessons can be learned by anyone setting on a path of discovery, even if that may mean a weekend trip to their local ethnic market. My free ebook is a window of opportunity for anyone to see how easy it is to live an empowered life. These truths work for anyone, no matter where you are or what you are doing. And if you are wanting to travel or if you travel already, then this book will help inspire you to start or to continue doing so. It will give you the confidence to know that despite the challenges of the journey ahead of you, it is an exciting one and one that will bring you many rewards and much fulfillment. How Do You Get This Free eBook? This is super dooper easy. All you have to do is fill in your name and email in the box below and the book will be delivered straight to your inbox. Make sure you put our email: cazcraig [at] ytravelblog [dot] com into your address book so you will receive the file. Our Latest Personal Updates and News! Recommended Travel Products, Travel Reading, and Travel Deals! Extension of the Ideas Presented in the eBook! If you enjoy the book, please recommend it to your friends, and feel free to drop a comment in the box below telling me your thoughts. We welcome any feedback, even the negative if it is constructive – we are never advocates for meanness.